The Dassault Mirage 2000 is the ultimate evolution of the delta-winged Mirage family and proved to be a highly successful aircraft. Attack, trainer and nuclear bomber variants have been delivered to the French air force, where it is gradually replaced by the Dassault Rafale. It has been widely exported to numerous countries such as India, Greece, Egypt, Peru, etc. These are the improved drawings I have created in early 2010. To see the original drawings, click here. 1. 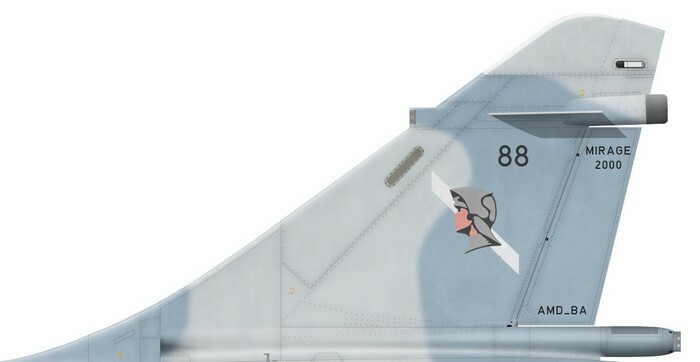 Mirage 2000C n°88, EC 1/5 “Vendée”. 2. Mirage 2000C (RDI) of EC 2/2 “Côte d’Or”, 1988. 3. Mirage 2000C of EC 2/5 “Ile-de-France”. 4. Brazilian F-2000C of the 1° GDA, the FAB’s only unit operating the type. 5. Mirage 2000C of EC 1/5 “Vendée”. 6. This Mirage 2000C of EC 1/5 “Vendée” received a special decoration when the unit was disbanded in 2007. 7. Mirage 2000C of EC 1/12 “Cambrésis”. 8. Mirage 2000B from EC 2/5 “Ile-de-France”. 9. Mirage 2000N from EC 2/4 “La Fayette”.